When it comes to restoring your smile, you want to find a specialist who is well-versed and understands the importance of careful planning and artistic vision. Main Line restorative and adult restorative dentist, James A. Vito, DMD, is a graduate of the University of Pennsylvania School of Dental Medicine and their prestigious Periodontal Prosthesis Program where he received dual training in Periodontics and Prosthodontics. Dr. Vito has been doing adult, full mouth reconstructive, and advanced restorative dentistry since 1987. Dr. Vito works with a dental ceramist in his office to ensure the best fitting and aesthetic restorations. To ensure your comfort, sedation services are available in our practice. A dental restoration is a man-made material that is designed to replace a missing or decayed part of a natural tooth while also restoring the strength and integrity of that tooth. The following is a list of commonly used dental restorations in ascending order of complexity: amalgam (silver) restoration, tooth colored restoration (bonding), inlay/onlay (overlay) restoration and the crown restoration. The tooth serves as a matrix to hold and support the restoration of choice. The less tooth structure present, the more demands that are placed upon the restoration to support not only itself, but also the remaining tooth structure as well. One must consider the biting forces placed on a specific tooth or teeth. Front teeth undergo “shearing forces” while back teeth undergo “compressive forces.” Some teeth experience both types of forces. 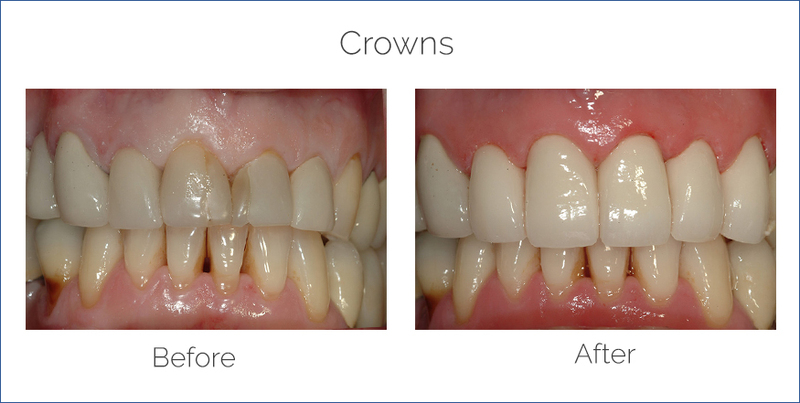 Each restorative option will be examined carefully to achieve the best long-term results and aesthetics. Perhaps the most important and the most overlooked part of choosing a dental restoration. The only way to achieve good oral health is to practice good oral hygiene. Not only will this reduce your chances of getting periodontal disease, but it will also improve the longevity of your restorations. Restorations do not get decay. Teeth do! The expectations of the most aesthetically challenging patient are met by collaborating with a superior dental laboratory, working with excellent dental technicians, utilizing the best and most aesthetic materials and understanding the wants and needs of the patient. Amalgam (silver) restorations represent a technology that is over 150 years old. When large amalgam restorations begin to fail, the best solution to preserve and strengthen tooth structure is with a laboratory designed and processed restoration. Inlay/onlay restorations are made in such a way that they fit into the tooth like a puzzle piece, while strengthening and preserving tooth structure at the same time. A porcelain inlay/onlay restoration represents a more aesthetic alternative to its gold counterpart and will provide many enjoyable years of service. Porcelain inlay/onlay restorations are designed to strengthen and support weak teeth and are stronger than amalgam or bonded restorations. For more information on our restorative dental procedures in the Philadelphia, PA and Main Line area call James A. Vito, D.M.D. (610) 971-2590.